Drinking for a cause doesn't need to be an annual gala or rare occasion, there are hundreds of opportunities to put your money and mouth where your heart is every day! On February 12th, Dr Pepper Snapple Group (NYSE: DPS) announced it plans to achieve a U.S. beverage container recycling rate of 60 percent by 2030. Quench your thirst and passion for the greater good with these beer, wine, coffee, spirit and other beverage brands that support charitable causes. GIVN water donates a portion of sales to non profits that promote clean drinking water. 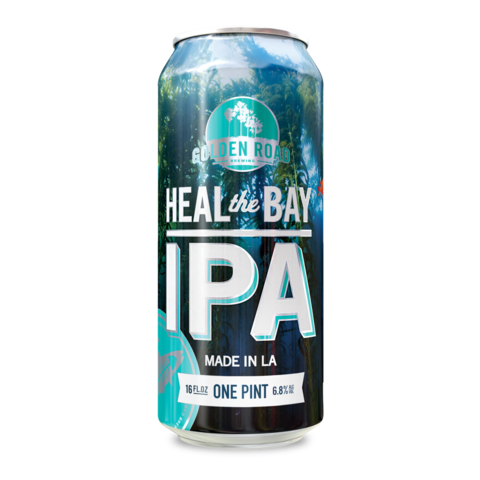 Heal the Bay IPA from Golden Road brewing supports beach cleanups and other efforts of local charity Heal the Bay to keep the Santa Monica Bay healthy and clean. SweetWater Brewing's Waterkeeper Hefeweizen supports nearby Chattahoochee Riverkeeper in its mission to protect the river supplying the brewery's water. A full dollar from every pour of 1876 ale (whether in the Beryl's Beer tap room or your favorite watering hole) goes straight to Denver Beer Olympics. TOMS (yes, the shoe company) helps you start your day with a warm cup of coffee from their TOMS Roasting Company purchase. As with their shoes, their coffee is also part of their One for One® tradition; just like your purchase of a shoe provides a pair to someone in need, so does your purchase of their beans (or other coffee related products). One TOMS Roasting Co. product purchase provides someone somewhere in need of clean drinking water with just that: vital, necessary water. There are many other coffee companies that give back to charities and the communities they grow their beans in, so be sure to look for more (Three Avocados, the aptly-named Socially Conscious Coffee, City Centre Coffee, Grounds and Hounds, etc.). A simple way to ensure your coffee is also positively impacting the world, check to see if the company is Fair Trade and/or even a B Corp. Pronounced par-say, from the Columbian phrase meaning good friend, Parce Rum plants a tree to protect biodiversity and prevent deforestation in Colombia for every bottle purchased. Cathead Distillery was the first legal distillery in Mississippi following prohibition. Their spirits support blues music through a variety of organizations. Whether you purchase a bottle of wine or send one to a friend, here are some bottles that give more than a delightful flavor balance. Chateau La Paws supports North Shore Animal League America by featuring rescue dogs on their labels, and by donating to the cause annually. Gallo Family donates $1 to Meals on Wheels America for every cork or screw cap submitted by mail or text during their annual holiday drive, Every Cork Counts. Locate where to buy Gallow Wines, snap a picture of the Gallo Family cork or cap, and text “GALLO” to 811811. See reviews from Wine Review Online and Snooth. A portion of all proceeds from ONEHOPE wines are donated to charitable organizations, which vary based on the wine. For example, for each bottle of Gold Glitter Edition Brut Sparkling Wine (also available in silver) ONEHOPE gives an equivalent donation of 15 meals to a child in need. The similarly festive Rainbow Glitter Edition Brut Sparkling Wine funds one hour of operational costs for The Trevor Project’s lifeline, which provides crisis intervention and suicide prevention services to LGBTQ youth (for every 4 bottles purchased). Check out the Wine Mag Buying Guide and Review Journal for reviews. Buy on Amazon: NV ONEHOPE California Glitter Edition Brut Sparkling Wine 750 mL. Save Me San Francisco Wine Co. is a wine label of the popular the band Train. Band members decided to take their love of wine to the next level by partnering with Napa experts to produce fun song-themed wines such as Drops of Jupiter, Calling All Angels, Soul Sister, Hella Fineand more. Train donates proceeds to support Family House, a charity that provides temporary housing to families of seriously ill children receiving treatment at UCSF Benioff Children's Hospital. Buy from TG Wines or or Amazon, and see reviews from Wine Scores and Wine.com. Nestled on Treasure Island, in the middle of San Francisco Bay, Bravium Winery lets consumers vote from a list of charities to determine the donation to each. Check out the current list of nonprofits here then browse reviews from The Cellar and Wine.com. Available for purchase on Bravium’s site or Amazon. Tackitt Family Vineyards has a line of Explosive Ordnance Disposal (EOD) wines that are specially bottled to support the EOD Warrior Foundation. A portion of the proceeds of the purchase price go directly to the foundation - see all EOD wines here, and browse reviews from Wine Shopping and Vivino. You can purchase direct from Tackitt or from Amazon. A percentage of sales of each bottle of Middle Sister wines supports women and families in need. Check out their customizable labels for a beneficent gift, find it at your local Target, or purchase on Amazon.